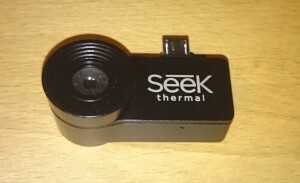 The Seek camera is not available in the UK yet (Booo!) but I got a friend in the US to get me one. It normally retails for $249 but I found it on sale for $200. Result! It has a 206×156 pixel sensor which is a LOT higher than the FLIR ONE 80×60 pixels! 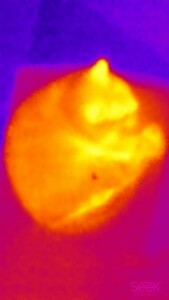 The FLIR camera mixes images from a visible light camera with the thermal camera to get a ‘better’ picture. 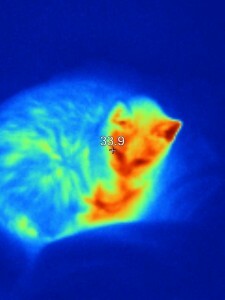 There is also the Therm-App camera which is better still but it is bonkers $$. That does not fall into the ‘toy’ price band. 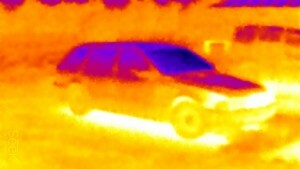 Anyway, minor issues given that I now have a thermal camera! WOOO! One of my moggies in glorious thermal rendering. My car. I need to play with the image settings and the colours. Still just pratting about with it basically. One mega gripe, the app is an utter bag of spanners! I thought the camera had died as the app would not recognise it any more. Cue serious panic and nerd depression at the prospect of a cool and slightly pointless birthday present dying within 10 mins of un-boxing. Turns out you have to manually kill the app to make it work again. GRR! But at least the camera is not dead. I know the Fluke did auto ranging so that is probably the reason for the greater contrast of temperatures. I’d also hope the Fluke had a better sensor for that money! It had a much larger lens so one would assume the sensors are very different. But I’m still happy with my new toy! Previous PostOur Nuclear LegacyNext PostIt ran fine!